France’s Blut Aus Nord are well and truly in a rut, having developed the whirring, industrial atmospheric clockwork of The Work That Transforms God over what is now five albums with little real variation between them. They’re notably getting smoother at it, going from what was some twisted, demented squeal on earlier albums to what is essentially a cold, mechanical professionalism now. They sound more like latter-day Godflesh than the icy black metal band that produced Ultima Thulée, and your reaction to this depends on what you want from them. 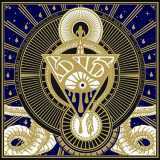 I’ll admit to being a tad harsh in my review of Odinist, although reading that review again, it strikes me that I could more or less regurgitate it unedited for this, the second in a trilogy of ‘777’ albums that seem destined to form one big, unwieldy concept album. It would be unfair, but fitting – The Desanctification follows on more or less exactly where Sect(s) finished earlier this year, even continuing the numbering of tracks. Same formula – juddering constructs of electronic beats, ominous guitar tones and croaked vocals, forming an atmospheric whirlwind around the listener. The difference this time around is that I find this far more effective than past efforts, suggesting that the band are much better at it. Epitome VII leads, with an almost catchy beat at the start that leads into softly spinechilling, post-industrial grandeur thanks to a clever mix of melodies, before collapsing into discordant twanging. Epitome VIII is harsher and weirder, roaring beastly vocals buried beneath an avalanche of industrial percussion and throbbing guitar lines, whilst Epitome IX is a pleasant surprise, going full ambient with the gloopy tones and eerie noises even more effective without the beats. Some strange choir-like clean vocals on Epitome X lead to almost catchy riff patterns, and the tolling repetition of Epitome XIII has a strange, listless spookiness all of its own... until it brings in the breakbeats, that is! Ultimately, there’s not a great deal of difference between the various tracks here unless you’re very familiar with them, and it’s only when you’re very familiar with them that they offer the most. I’ve softened towards Blut Aus Nord’s new direction enough to appreciate it for what it is, but still think they’re stretching a formula further than it can go.